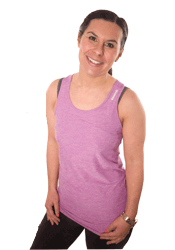 Well its been quite a week here at Little Mis-Fit HQ . Last week my boiler was condemned – they actually stuck a danger – do not use sticker on it! . To be fair the fact I had to give it a whack every time I wanted it on , did give me a small clue that it was on its way out. But still a new boiler eek! The up side is I don’t have to whack this one, its much quieter than my old one , which used to sound like it was taking off and also my house is once more nice and toasty – hurrah!. 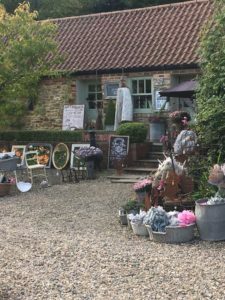 Last weekend I took a trip to Busy Bee studios in Durham https://busybeestudio.co.uk with my friend Erin – it was so pretty! . she had some gorgeous things. I got some gorgeous smelling Orange Cinnamon candles – they smell divine and very festive!. 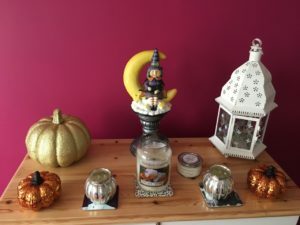 I did have a little trip up in the loft this week aswell to get some of my autumn/Halloween things down so I could start decorating in the house . 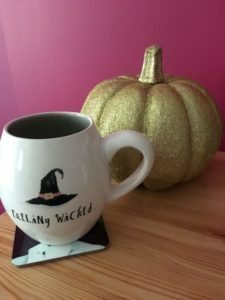 I’ve also been using my halloween mugs from Tk Maxx – loving those!. What with boilers , dental check ups – does anyone else get Dentist dread?? 😳. I had meetings , aswell as trying to keep on top of housework , and still juggling the two jobs alongside doing a business mentor programme , it is so easy to get a little overwhelmed – and I know a lot of you guys are the same – juggling Work/kids/looking after elderly parents – our own self care does seem to go out the window at times. So I am making a huge effort to make sure I am prepping and organising food and eating healthy meals , aiming to get enough sleep ( a work in progress) and fitting in my own workouts aswell as taking a little time out in my week to just be. I do find though that when I do take time out – my creativity increases and the ideas flow so I know – when I think I am too busy to stop and take a breath and get some time out , that is actually when I need it more than ever!. Some of my favourite ways to get some self care time are below. I would love to hears yours too!. Add them in the comments! 💕 Getting outside – I think fresh air is a brilliant tonic for the mind and soul. going for a run or walk or just taking my book in the garden instantly soothes my spirit. 💕 Take time to relax before bed – I am terrible sometimes for working late into the night , but I am trying to cut off by 9pm and doing something other than work related – watch some youtube videos – loving Grace Denny’s channel – if you love makeup, clothes and TK Maxx and drinking tea – her videos are brilliant! . plus She loves Halloween and Christmas so combined with her love of makeup – I love her ha. I also love to listen to podcasts too. 💕 Curling up with a book – I love to read and have done since I was a little girl . So taking time out to curl up and lose myself in a book is heaven – especially if we add a large cup of Lemon and ginger or peppermint tea and a bag of chocolate buttons (shh). 💕 Meeting up with friends – This is a big one, I think all of you fellow Girl bosses running their own business’s will agree that it can be a lonely journey at times and sometimes you do get so caught up in work and getting overwhelmed with your to do list and sometimes just talking things through with someone on a similar journey can help you feel much better. 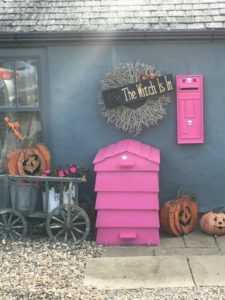 💕 A good Netflix binge – Or a boxset or Movies 24 – especially when it becomes Christmas 24 (can you tell I’m a bit of a Christmas elf) . We are currently watching Making a murderer on Netflix – It is so good!. if it is just me watching though, I love Good girls – amazing!!!! and Cheasepeake Shores. 💕 Working out – something that often slips down the To Do list when we get busy . I promise though taking even 15 / 20 minutes in your day to get moving – doing a workout – hiit, yoga/pilates, Dance around your living room, taking a walk – I promise you will feel so much better for it! . exercise really is a brilliant mood booster, it will also help boost your energy levels so you can tackle that to do list more efficiently . It also helps boost your immune system – something that lowers if we run ourselves down too much. 💕 sleep!. Making sure we get enough sleep. Aiming for a good 7-8 hours a night. It’s when we sleep , that our bodies repair themselves , our cortisol (stress hormone ) levels lower and our energy levels replenish. 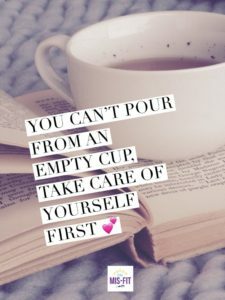 So I am making my Self care Pact here – to make sure I look after myself so I can continue to make sure you guys are all looking after yourselves too. Especially as we head into this last quarter and probably the busiest few months of the year! Comment below with what you are going to aim to do for your own self care pacts!